Hair removal creams will help to remove hair that grows all over the body. After puberty, hair becomes thicker and more visible, particularly on men. This can be embarrassing or uncomfortable for people to endure. Some sexual, religious or medical practices encourage patients to remove their hair. Hair can be removed by shaving but this is only a temporary solution. Shaving can also irritate the skin, making the area more sensitive. Instead, hair removal creams will allow you to wipe away unwanted hair. Understanding how these creams work and how they should be applied will help you determine if this is a viable solution for your desired hair removal. Hair removal creams are a depilatory product, meaning they are designed to remove hair from the body. They contain alkaline chemicals such as sodium thioglycolate, calcium thioglycolate or strontium sulfide that will react with the hair so it can be removed. When these products are placed on the skin, these chemicals will bond with the proteins known as keratins that create the structure of your hair, causing them to dissolve. After a short amount of time, the hair will become so weak that it falls out of the follicle. 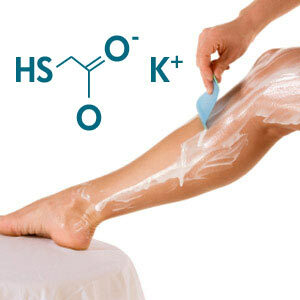 The combination of chemicals, typically sodium hydroxide and calcium thioglycolate, in hair removal creams can create an unpleasant odor, though some brands will add additional ingredients to mask this. Different types of creams are intended to be used with different skin types. Talking with your doctor will help you determine which product will be the most effective on your skin without causing irritation. What Are the Benefits of Hair Removal Cream? Hair removal creams make it easy to remove unwanted hairs in a way that is easier and more manageable than some other hair removal options. These products are usually relatively inexpensive, making it easy to find a cream that will suit your needs, even if you are on a budget. This also means that you can experiment with several different brands to find one that works well without having to spend a great deal of money. Instead of fussing with shaving or tweezing, all you need to do is rub a bit of product on the area where you do not want hair to show, wait a few minutes, then wipe the cream and the unwanted hair off. The process is not painful like waxing. It is also less likely to irritate your skin if you find the right product for your skin type. What Are the Problems of Hair Removal Cream? While these products may offer an easy solution for hair removal, there are some considerations you should make before you begin using these products regularly. Hair removal creams can be messy. You will need to practice applying these creams so you can get used to what you need to do to adequately break down the hair. Otherwise you may get uneven results that are unattractive. These products also contain harsh chemicals that can burn the skin or cause an allergic reaction. Users are encouraged to read the directions carefully before applying hair removal creams to avoid a potentially negative reaction. Even if you have used hair removal creams, you should always test the product before using a new hair removal cream on a large area of the body or your face. Place a small amount of cream on a patch of skin and wait to see how your skin reacts over the next 24 hours. If any redness, itching, peeling or stinging occurs on your test patch, wash the hair cream off immediately and refrain from using this product. If you do not develop a reaction, check the area you plan to use the product before you apply it to ensure that there are no blisters, cuts, razor nicks or other sensitive patches that may react poorly to the cream. Do not use hair removal creams near the eyes, including removing hair on the eyebrows as tis can cause serious irritations as well. There are a number of factors that you should consider when choosing a hair removal cream. Check the ingredients to ensure the product does not contain any ingredients you might be allergic to. If you have had any breakouts or developed skin sensitivity when using other similar products, you may want to refrain from using hair removal creams. Check with your doctor to determine if there are products that might be more suited to someone with sensitive skin. Products that contain aloe or moisturizers are often better tolerated by these groups. You also want to consider where you will be using the product before you purchase a hair remover. Never use products intended for the back near the pubic area or bikini line because this area is quite sensitive. Instead, use a product specifically designed for this area to prevent a potentially negative reaction. It is strongly recommended that you avoid placing hair removal cream on any part of the body that your underwear would cover as this can cause serious irritation. The area where you will be applying the cream may also dictate what type of application would be most appropriate. Creams are available in gels, roll-ons or in tubes. Different products will be thicker, allowing them to stay in place, or give you more control when they are applied. Determine if you will need a great deal of control or if you will need a product that can be slathered on a larger area of your body to help you decide which product is most appropriate. Popular hair removal creams include Vaniqua, Surgi Cream, Revitol Hair Remover Cream, Nair Cream Hair Remover and Veet Hair Remover Cream. You can learn more about these products to determine which would be the most appropriate for your needs by surfing the Internet.